You can view your pictures as a slide show from the Organizer in Photoshop Elements. In addition, you can set up a self-running slide show (in Full Screen view), complete with transition effects and background music. Full-screen viewing temporarily hides the Elements tools and menus, and gives you the most viewing area on your monitor to see your pictures. Creating slide shows and outputting to a file is supported only on Windows. However, viewing slide shows in Elements is supported for both Windows and Macintosh users. Select images that you want to see in a slide show or use all the images in the Organizer for your slide show. If no images are selected when you enter Full Screen view, all photos in the Organizer window are shown in Full Screen view. Choose Display→View, Edit, Organize in Full Screen. You jump right into the Full Screen view with some panels and tools displayed. Photoshop Elements takes you right to Full Screen view after you press the F11 key (cmd+F11 on the Macintosh). Click the arrow keys at the bottom of the screen to move forward and back through the slides. You can also click the Toggle Film Strip icon (first icon on the bottom left of the screen) to show a filmstrip. Click a slide, and the main window displays the slide. Exit the Full Screen view. Press the Esc key on your keyboard to return to the Organizer window. Select images that you want to see in a slide show in the Organizer window. Press the F11 key (cmd+F11 on the Macintosh) to change the view to Full Screen mode. Click the Change Settings tool on the toolbar at the bottom of the window. The Full Screen View Options dialog box opens. Click the Change Settings tool. Make adjustments in the Full Screen View Options dialog box. Select the Start Playing Automatically check box. By default, you also have an audio file play for the duration of the slide show. To choose another file, click the Browse button and select an audio file from your hard drive. Play the slide show automatically. Click OK and watch the show. Press Esc when you’re finished viewing the slide show. When you open selected photos from the Organizer in Full Screen view, you’ll find two panels on the left side of the screen. The Quick Edit panel provides Quick Edit tools for editing photos, such as sharpening images and removing red-eye. The Quick Organize panel permits you to add keywords for easily organizing photos with keyword identifiers. 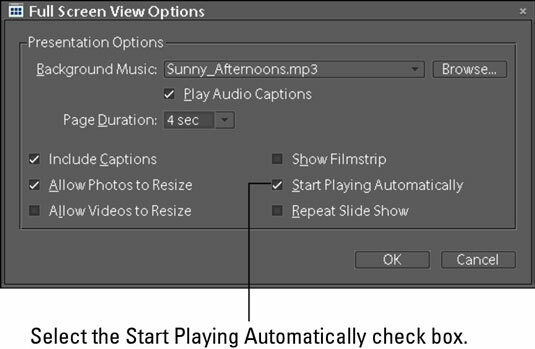 Toggle Filmstrip: Click this tool to show/hide the filmstrip on the right side of the window. Toggle Quick Edit panel: Shows/hides the Quick Edit panel. Toggle Quick Organize panel: Shows/hides the Quick Organize panel. Previous Photo: Click the left arrow to open the previous photo. Play/Pause: Click to play or pause a slide show. Next Photo: Click the right arrow to advance to the next photo. Change Settings: Click to open the Settings dialog box. Transitions: Click the Transitions tool, and the Select Transition dialog box opens. Four different transition effects are displayed in the dialog box. You can preview a transition effect by placing the cursor over one of the images. When you find an effect you like, click the image and click OK to change the transition. Toggle Properties panel: Click this tool to open the Properties dialog box. Show all controls (right arrow): Click the tiny right-pointing arrow on the far right side of the toolbar, and the toolbar expands to reveal additional tools.